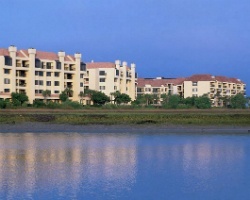 Discover the stunning scenery and beautiful surroundings of Hilton Head Island at Marriott's Sunset Pointe resort. Find timeshare resales and rentals at affordable rates today. 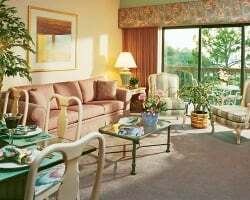 Located in the picturesque Shelter Cove alongside its sister resort, Marriott's Harbour Point at Shelter Cove, the Marriott Sunset Pointe resort offers supreme comfort along the warm Atlantic shores of Hilton Head Island. Make your beach vacation dreams come true at this luxurious offering from Marriott, complete with upscale amenities like outdoor swimming pools, a golf practice tee, and an on-site marketplace. Spend your days lounging at sunny spots like Coligny Beach, or shopping 'til you drop at Harbour Town. Whatever it is you choose to do, there's no other way to do it than with your very own Sunset Pointe timeshare. The aptly-named Sunset Pointe resort features accommodations that will allow you to watch the sunset over the Harbor River. The resort's two bedroom villas are ideal for families or groups of friends numbering up to six, and include modern furnishings that will ensure everyone's complete comfort. Lounge on your own private balcony with a cold drink, or prepare your own meals in your unit's fully-equipped kitchen. Other amenities, such as the laundry machines and free WiFi, are guaranteed to give you a perfect, carefree Hilton Head vacation experience. Are you ready to secure your very own accommodations in Hilton Head Island? Fill out the form on this page, or call a representative at 1-877-815-4227 to learn more about ownership opportunities at Marriott's Sunset Pointe. Buying a timeshare resale at the Marriott Sunset Pointe resort can provide you with years of great trips to Hilton Head packed with great perks, all for a fraction of the typical cost. Unlike traditional timeshares offered by the resort that carry inflated prices, timeshare resales are offered for sale by current timeshare owners. This means that you can find the same great ownership solutions at the Marriott Sunset Pointe Hilton Head for much more affordable rates—you can even find units priced up to 70% lower than retail. You won't have to settle when purchasing a timeshare resale. Postings at the Sunset Pointe come in the form of deeded fixed and floating weeks spread throughout Marriott's Silver, Gold, and Platinum seasons, giving you a variety of options to choose from. You'll be able to find a unit that matches your vacation preferences as well as your budget, ensuring you don't overpay for accommodations you don't want. You could also use your resale at the resort to enter the Marriott Vacation Club for added exclusive benefits. 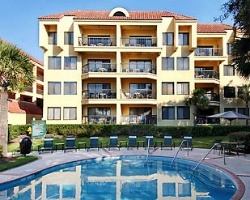 The Sunset Pointe resort is affiliated with the Marriott Vacation Club. As such, timeshare resale buyers at the resort could have access to some of the club's best features. Resale buyers can start making reservations at the Sunset Pointe using their deeded week immediately, but upgrading to Marriott Vacation Club Destinations points can unlock additional benefits. You can switch to an easy-to-use points-based system for making yearly reservations, and you can also exchange your timeshare internally for stays at other Marriott resorts. A membership with Interval International can help you maximize your timeshare resale ownership by allowing you to travel the world. As the official timeshare exchange affiliate for the Sunset Pointe resort, Interval International can enable you to trade your Hilton Head accommodations for stays at other resorts across Interval's global exchange network. The resort is also a Premier rated resort with Interval, noting its above-average accommodations and amenities, as well as increasingly positive reviews from former guests. This means you'll be able to exchange with resorts of similar quality and standards. The perfect beach vacation is just around the corner at the Marriott Sunset Pointe resort. This stunning property goes out of its way to provide an amazing number of on-site amenities and services to make your vacation complete and carefree. Lounge and tan by the outdoor swimming pool or stay active at the fitness center. Hit the basketball and tennis courts for some friendly competition, or host tournaments at the shuffleboard and bocce courts. Head to the beach just a few minutes for endless fun in the sun, or traverse through Shelter Cove Marina for upscale restaurants and deep sea fishing excursions. Hilton Head Island is also a golfer's paradise, with dozens of PGA-sanctioned courses in the area. Tee off at the Country Club of Hilton Head or the Robert Trent Jones Course. Further south, Harbour Town is filled with boutique shops and restaurants, providing excellent rainy day activities. Outdoors enthusiasts will also feel right at home on the island with plenty of opportunities to kayak through the Harbor River inlets or trek the Pinckney Island National Wildlife Refuge. Already Own at Marriott’s Sunset Pointe?